RANDOM: MORTUARY ANCESTOR "The Reincarnation"
MORTUARY ANCESTOR is a well-versed name in the Sabah/Borneo scene, I might say so. It’s been a while that I’ve heard of anything from them. Along came this CD in the mail then. Here lies several tracks recorded on different occasions. What I’m hearing in this is some straight-up, honest death Metal in the tried and tested ancient formula, heavily leaning towards those prescribed by MORBID ANGEL (there’s even a cover of their song here), unmistakably so. I regret the muddy and crude recording quality though, it certainly affects my appreciativeness in a way or so. There should be more that I could have lashed out from this release, if only the productions could be a tad better. 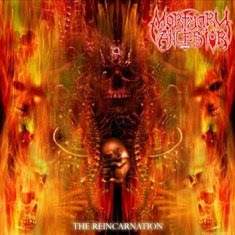 And if my memory serves me right, I’ve heard of a more inspired MORTUARY ANCESTOR before “The Reincarnation”, another fact that could be challenged given a better, proper production they definitely deserve. Only for the die-hards, “The Reincarnation” is.